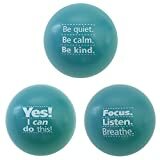 BUY IN BULK AND SAVE 10% when you purchase 3 or more stress ball 3 packs. No coupon code required, offer will be applied at checkout automatically. Intelligence Development: Fine argument of Newton’s law of motion and the starting point of physics. (Newton’s Laws of Motion:)For every action there is an equal and opposite re-action.Inspired us to better understand the concept of conservation of momentum. Premium Quality: Silver Ball Made of high quality Stainless Steel that will last for long. 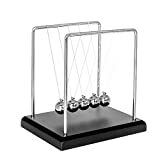 Base of the Newton Cradle Pressure Relive Toys: Non-toxic wooden.Size: 18*12*18cm/7*4.75*7Inch. SWING TIME—The balls continue in perpetual motion FOR ONLY 15-25 SECONDS due to the resistance of the air and friction. We can not create a vacuum environment, so the balls will have some space when it is working, but it won’t influence the effect of playing. Versatile Use: great present for office decoration, your boss, husband, wife, boyfriend, and/or girlfriend. Surely will be loved by kids under 21, grandsons, psychology classrooms, science, physics classrooms, and kids with ADHD. 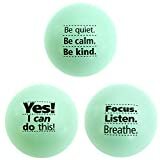 Also, it is great to relieve kids of stress and frustration. Its unique and simple design make it highlight over most office desk accessories. Packing include:1x Newton Cradle .7-15 business days for delivery with free tracking number. 3 Months Refund and Resend Guarantee with no Hesitation. Before leaving a negative feedback, pls contact us via email in advance. 2. Intelligence Development: Fine argument of Newton’s law of motion and the starting point of physics. (Newton’s Laws of Motion). For every action there is an equal and opposite re-action.Inspired us to better understand the concept of conservation of momentum. When you received the item, please take the balls out one by one£¬or the balls may be tangle up.